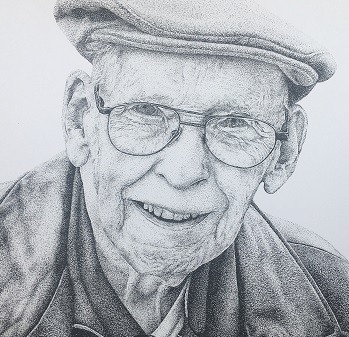 Obituary for Robert L. Wyerman | Laughlin Memorial Chapel, Inc.
Age 95, of Mt. Lebanon, passed away peacefully on Thursday, January 17, 2019 at St. Clair Hospital in the presence of family. He was an Army Air Force veteran of WWII, church leader and a gentle man completely devoted to his family. Bob graduated from Penn State University. He worked as an architectural engineer at ALCOA in Pittsburgh for 23 years before retiring in 1986. An active member of Sunset Hills United Presbyterian Church in Mt. Lebanon for 54 years, Bob served as an elder, tireless volunteer and a ‘Monday Morning Marvel’ working on church construction projects. He loved the outdoors, gardening, family camping and Penn State football. Besides being Mr. Fix-It for his kids, Bob was a talented watercolor artist and woodworker. Beloved husband for 70 years of Ileana (Hutchinson) Wyerman. Brother of Kenneth E. Wyerman of Coatesville, PA; cherished father of Barry R. Wyerman (and wife Karen) of Huron, OH; James K. Wyerman of Takoma Park, MD; Marilyn S. Wagner (husband Robert) of Wexford, PA; Kathleen A. Stockdale (husband Greg) of Dallas, TX; grandfather of Emily Capuria, Katy LaBarrie, Chelsea Wagner, Grady Wagner, Max Stockdale, Owen Stockdale, and Brynn Stockdale; great grandfather of Mac Capuria. He was preceded in death by his parents Luther E. and Mary (Boop) Wyerman of Hollidaysburg, PA, and siblings Leota Wyerman Shope (husband Buzz) and Donald G. Wyerman. A memorial service will be held at the Sunset Hills Church, 900 Country Club Dr., Mt. Lebanon, PA on Friday, January 25th at 11:00 AM. Friends and family are also invited to a 12:30 luncheon in the church hall. In lieu of flowers, donations may be made to Sunset Hills United Presbyterian Church.